Interstate 80 at Donner Summit, CA. With 100 terrain park features, beginner park riders have a wide selection of jumps, rails, and boxes designed especially for introductory terrain park sessions and lessons. Boreal even offers introductory terrain park lessons. Best of all, beginner features are close to the base lodge, allowing for park newcomers a little R&R in between runs. 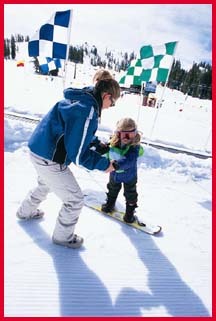 Boreal offers an extensive beginner program, including both traditional lessons and terrain park coaching. Boreal offers three sessions of beginner lessons a day, packages include a lift ticket, lesson and rental gear. While the parks may be the place to hone your skills, Boreal remains one of California's best places to learn the sport, and then learn to freeride and freeski in the parks from a dedicated staff of ski and snowboard instructors.